This recipe is based on one by Simon Rimmer. Now that the weather’s getting colder and it’s dark by the time I’m home from work I crave comfort food, I’m sure everyone does, and pie is the ultimate comfort food. 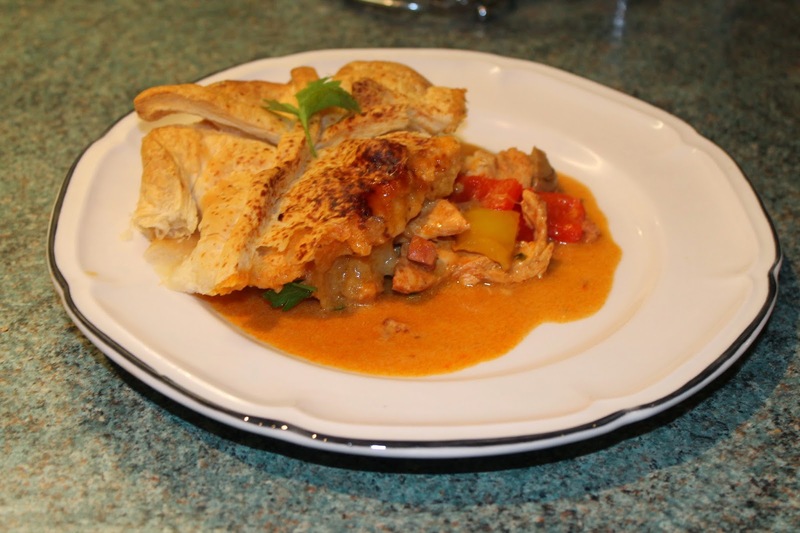 This idea for a pie sounded delicious – I love stroganoff but I’d never had a chicken one, and everything is better with pastry. This is a really smoky, creamy pie which you could throw any veggies you have hanging around into – I had three peppers in the fridge which I used, but frozen peas or green beans would go wonderfully too. This will serve 4 and takes around 1 hour to make. 1. Slice the chicken breast into bite sized pieces and coat with 1 tablespoon of the paprika. Heat the oil in a casserole dish over a medium heat and add the chicken. Brown, then remove from the pan and put to one side. 2. Add the lardons to the casserole dish, brown, and then add the chopped onion and roughly sliced mushrooms. Cook for 3 minutes, then add the white wine. Allow the wine to bubble down, then add the stock. Simmer for 20 minutes, until the stock has reduced by half. 3. Chop the peppers and add to the casserole dish, add the chicken, the rest of the smoked paprika and the soured cream. Taste and season with salt, pepper and more smoked paprika if necessary. Stir in the parsley. 4. Tip into an oven proof dish and top with the puff pastry. Cook in the oven for about 20-30 minutes until the pastry is puffed up and golden brown.